The silent films have returned with a blast— not comedies, not slapstick, not in black and white. Yet they have no dialogue, only music to carry the action along. 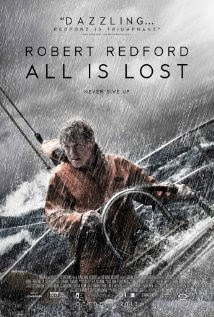 Recently we watched “All Is Lost,” starring Robert Redford. His facial expressions do all the "talking." That’s all. The main character is really the sea, or the contest between the man and the sea. Water is both alluring and full of unpredictable danger as most of us know. It’s like God. We can’t stay away from it, and we can’t manage it, though we try. The almost 2-hour film opens with the classic note in a bottle. It’s a note of apology from the sailor. He has set out on some quest or other and he anticipates his death. The note is obviously to loved ones. “I’m sorry,” he reiterates as if it were punctuation. Every single second of this enormously ambitious film is full of suspense. I didn’t even get up to get more cookies, and I disciplined my bladder. You can’t tear your eyes away from this stupendous and wordless struggle between Humanity and Nature. How is this film spiritual? I learned from a seasoned and wise Jesuit that a sound spiritual life is spent discerning Godde’s spirit and moving with it. Such discernment required three things, no matter what your circumstance: awareness, sensitivity and action. All three! Exercising all these together, one gets closer to knowing and loving oneself—and also God. God-knowledge and self-knowledge are correlative. The sailor asserts these three gifts consistently, repeatedly, and in the most minute, often startling ways. This story is not about a casual leap into adventure for the sake of a testosterone high or simply to prove oneself. This man is more prepared than the best of Boy Scouts. He has learned uncanny skills, such as training his lungs to hold air far longer that most of us can. His craft has every single bit of equipment imaginable. It is stocked with every provision, and then some. The man is an accomplished sailor, and, though aging, has obviously worked on physical fitness. He is strong in every way. The man raises awareness to an art form, paying attention to everything. For example, he notices the huge plastic container of water, not potable. It’s useless and a painful reminder that he is dying of thirst. (I thought of one of Jesus’ remembered words as he was dying: “I thirst.”) Suddenly he sees the discarded water container in a completely new way. He is alert, sensitive to its new meaning. It can help him desalinate sea water, a skill he learned in preparation for this journey. Despite exhaustion and being near death, he leaps into action to create a desalinating apparatus. Go figure! In one imaginative moment he stares attentively, apparently aimlessly, at an empty tuna fish can—useless, empty, trash. Yes, in one way, but the man scrutinizes it, contemplates it really, and it leaps into new focus. He bores a hole in it and rigs it to use as bait to lure swarms of small fish to follow it. Their movements create a current to push his raft along. In the end all is lost and the man makes a decision to jump into the inimical sea. The ending twists and turns in naked but not sentimental ambiguity. All is lost, isn’t it?